Tag No: 120 / 4-5 Years: Chest:62cm/24.4" , Dress Length: 63cm/24.8"
Tag No: 130 / 5-6 Years: Chest:65cm/25.5" , Dress Length: 67cm/26.3"
Tag No: 150 / 8-9 Years: Chest:71cm/27.9" , Dress Length: 75cm/29.5"
Round neckline and hidden zipper, Floral lace top bodice: the embroidered flower on the yarn, embeding on the bodice. A sash tie made of soft touched polyester fabric with a bowknot decrated on the waist, making your princess looks more slim. 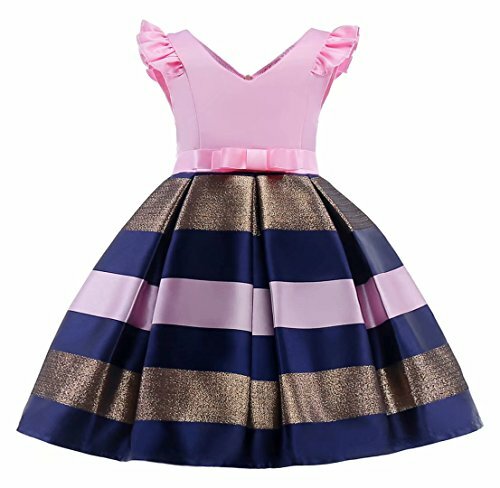 This dress prefer for any dressy ocasstion such as for wedding, birthday party, flower girls bridesmaids, formals proms, or children's dress up play etc. If you have any questions about this product by AYOMIS, contact us by completing and submitting the form below. If you are looking for a specif part number, please include it with your message.